Space | Something should go here, maybe later. Jupiter has it’s giant spot, and not it seems Saturn has it’s own mystery feature (other than it’s rings) – a Hexagon at it’s north pole. How weird is that! 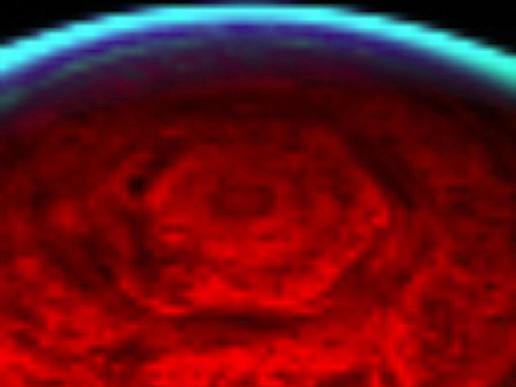 This nighttime view of Saturn’s north pole by the visual and infrared mapping spectrometer onboard Cassini clearly shows a bizarre six-sided hexagon encircling the entire north pole, in one of the first clear images taken of the north polar region ever acquired from a unique polar perspective. The hexagon feature was originally discovered by NASA’s Voyager spacecraft in 1980, but those historic images and subsequent ground-based telescope images suffered from poor viewing perspectives. In the new infrared images, the strong brightness of the hexagon feature indicates that it is primarily a clearing in the clouds, which extends deep into the atmosphere, at least some 75 kilometers (47 miles) underneath the typical upper hazes and clouds seen in the daytime imagery by Voyager. Thick clouds border both sides of the narrow feature, as indicated by the adjacent dark lanes paralleling the bright hexagon. Truly, there is much we do not understand about our universe! Those of us who know that we’re being overtaxed at the rate of $1,000 a month per household appreciate Labour’s $10/week. That’s if you have a family. Or maybe it’s a gross insult. One or the other. The real question is, what happened to the other $960? On this day in 1959, the first pics of the other side of the moon were presented to an unsuspecting world. They used 35mm film. The report doesn’t say how they got them back.